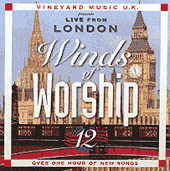 Winds of Worship: Vineyard Music EXTRA! These albums are recorded during the worship sessions at the Winds of Worship conferences held around the world. When Chris Wimber, son of Vineyard movement founder John Wimber, sat down at the sound board at a Winds of Worship Conference in Anaheim, California and started to record what was happening, the worship leaders had no clue they were being recorded. What ended up on tape that night was an honest reflection of intimate worship to God. After being copied and sold at the Vineyard Church in Anaheim, Chris had the idea to make them available through Vineyard Music Group. The first two volumes of the Winds of Worship Series are these same tapes transferred to CD and Cassette. Today, what began as a personal tape for Chris Wimber and his friends has become one of Vineyard Music Groups most popular ongoing series.